Just off of Main Street at the corner of Martins Lane, this Beautiful Antique home was extensively renovated in 2002. In 2017 an all new central Heating and AC system was installed. The 2002 project included extensive structural and mechanical work from foundation to roof. This newly decor-ed and freshly painted 4 bedroom home is complete with a large roof walk and is a short downhill walk to Main Street. The family room with fireplace opens to the private porch which overlooks the new blue stone patio w fire pit surrounded by lovely gardens and tall trees. Special features include custom gourmet kitchen, 8 fireplaces, historic details and two new tiled baths. Lower Level Bulkhead access to the partial basement storage area. Modern HVAC system just installed, hot water heater and access to other utilities. An extraordinary property in the heart of the historic district. This hidden gem is tucked away on a shell lane. ..
An extraordinary property in the heart of the historic district. This hidden gem is tucked away on a shell lane .. Attention investors and business entrepreneurs! Don’t miss this rare opportunity to acquire a multi-unit commercial building in one of Downtown ..
Rare opportunity to own an in town condominium with off street parking,conveniently located within a very short distance to Main .. Prominent in-town commercial building with strong street visibility consisting of four well-established tenants. This fully-leased three-story building is on an ..
Two cottages and ample parking on a private, dead end street just moments from the center of town. Two bedroom ..
Delightful pied a terre on the edge of town with easy access to beaches and mid-island amenities. The home was .. Incredible opportunity on one of the nicest streets in the Old Historic District. Presently set up as a two family ..
RARE MULTI-FAMILY OFFERING in the Old Historic District. Great potential for rental income or single family conversion. Quiet convenience to .. This in town antique home is ready for your renovation with approved HDC plans in place, drawn by Ethan McMorrow. ..
With a nearly $400,000 reduction in the list price, 35 Pine Street represents one of the best values on the .. Featured on HGTV, this light-filled condominium is just moments to Town, even closer to Nantucket Harbor and is surrounded on .. Cute two bedroom, two bath cottage ready for a new owner that can restore it to its original charm. Set ..
Old North Wharf Co-Op is a unique Nantucket community. Park your boat on your door step and park your car .. Contemporary 3 Bedroom home with central great room with vaulted ceiling, fireplace & gourmet kitchen open to spacious blue stone .. Brand new, high quality construction in Town, featuring three floors of living space. Five bedrooms each with an en-suite bath .. This gracious, 1830’s-circa Federal style home is being brought to market as a thorough and masterful renovation orchestrated by Andrew ..
Charming cottage located just off the monument at the top of Main street. Many wonderful features in this home including .. The Benjamin Coffin House was originally built circa 1772 and underwent a thoughtful and thorough renovation in the 1970s. Brimming ..
Tucked away off Washington Street behind the Maria Mitchell Association and across the street from waterfront property owned by Nantucket .. This 1790’s home has been in the same family for eight generations beginning in 1854. Now it is time for .. Historic Main Street Building, in the heart of downtown, offers opportunity to purchase a first floor Retail Condominium. Unit 1 ..
Conveniently located at the edge of Nantucket’s storied historic district, this four bedroom, four bathroom property offers a comfortable blend ..
TOWN & COUNTRY, the best of both! This attractive, nicely maintained home is located one half mile from Main Street ..
Summer Living at its Finest! Expect to be wowed by this meticulous private oasis featuring a four bedroom home integrated ..
CENTER STAGE! This elegant blue building is perched prominently on Center Street in the heart of Nantucket’s core retail/commercial district. ..
In-Town living at its best. This newly-built, three-story, Union Street home in the ROH, offers modern amenities with classic flair. ..
Rare opportunity to own a newly constructed custom built home conveniently located within a very short distance to Main Street ..
Commercial opportunity. Two apartments upstairs and a 990+/- sf retail space on the 1st floor. Excellent location with potential to ..
Two blocks from upper Main Street, this bright and sunny home with over 4,000 s.f., offers lots of possibilities. Built .. Your brand new home in the old historic district awaits. Thoughtfully designed, this 6-bedroom, 5 ½-bath home offers three completed ..
A sun-drenched oasis on 1/2 acre just outside the heart of Downtown Nantucket. This four bedroom, well-built home offers low-maintenance .. Enter through a hidden lane into a lush, pastoral setting with access to meandering paths through 5 acres of protected ..
Commercial Building on Orange Street. Luxury one bedroom apartment on second floor, office spaces on first floor and lower level .. This Victorian four bedroom home has been fully updated to maintain its historic charm and character. Ideally situated in the .. Beautifully maintained and updated in-town antique with 5 bedrooms, central air-conditioning, alarm system, wood-burning fireplaces and off-street parking. 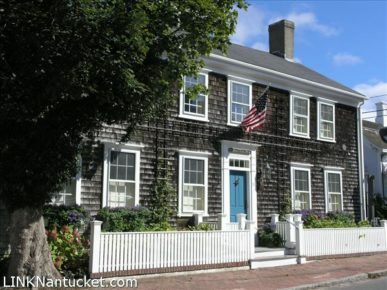 Situated on ..
‘Union Jack’ is a beautifully restored whaling captain’s home located in the heart of Nantucket’s historic district. Built in 1806 .. Located just moments to Town and completely renovated/updated in 2011. This meticulously maintained 3 bedroom and 2 bath home boasts .. This meticulously maintained antique retains much of its historic integrity along with the comforts of modern living. The oversized lot ..
Rare opportunity just off Main Street! A short walk to dining, shopping, and the best of what Nantucket has to .. Beautifully restored in-town antique on an oversized, corner lot. Everything has been replaced; foundation, plumbing, electrical, roof, shingles, fireplaces, etc. ..